Ian signed for United in July 1962 aged just sixteen. A former schoolboy international, he joined United, initially on an amateur form from Woodburn Athletic. 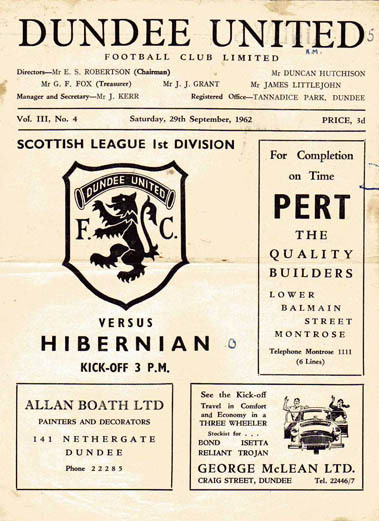 Two months later he became the youngest player to turn out for United, when he made his debut against Hibs at Tannadice and by the end of his first season, he was firmly established as a first pick. Before signing professionally in May 1963, he helped the Club reach their first ever Scottish Cup semi-final and later their first League Cup semi-final during the 1963-64 campaign. He finished the clubs top scorer that season, and grabbed his first senior hat-trick against St Mirren in December 1963. Ian’s number of appearances dropped slightly over the next couple of seasons, but still played his part, helping United qualify for European Football for the first ever time in the Club’s history at the end of the 1965-66 league campaign. 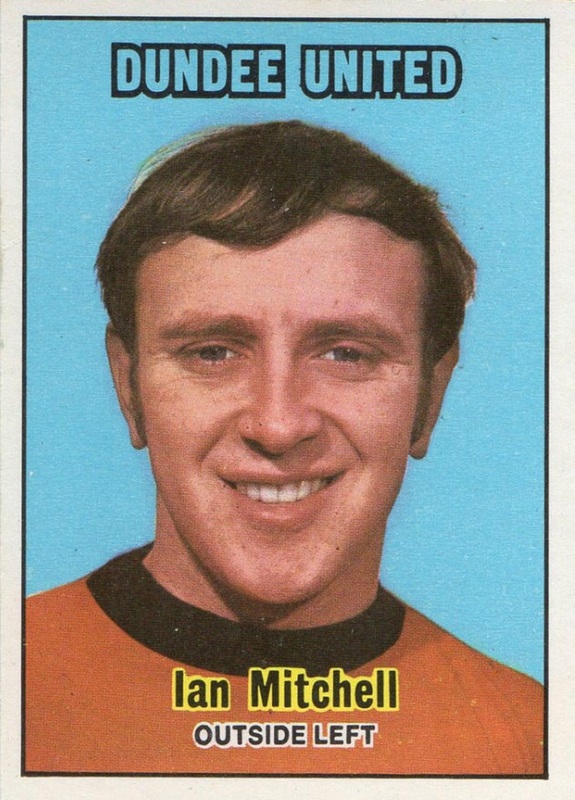 Having played most of his career so far as an inside-forward, Ian was moved into centre-forward for parts of the 1966-67 season in the absence of the injured Finn Dossing. It was in this position that he played in both legs of the Fair Cup tie versus the holders Barcelona, and scored the opening goal in the second leg at Tannadice. 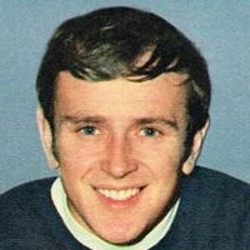 He once again finished as United’s top scorer, and gained international recognition, playing for the Scotland Under-23 team in victories over Wales and England, before travelling with the Club to the Unites States to represent Dallas Tornado in the United Soccer Association in the summer of 1967. He continued his excellent goal-scoring form, finishing as the top scorer twice over the next three seasons, including hat-tricks against Stirling Albion, Airdrie and Raith Rovers. Having played against Newcastle United in the Fairs Cup in October 1969, nine months later he was transferred to the English side for reported fee of £50,000. Having made only five appearances, he was back at Tannadice fourteen months later, as part of a swap deal that took Alec Reid to Newcastle. 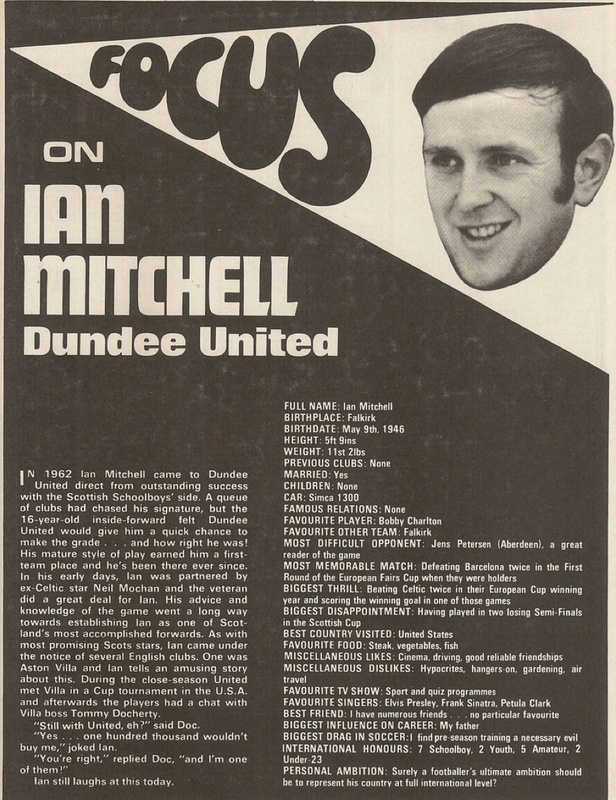 Ian spent the next two seasons with United in a supporting forward role, chipping in with some vital goals, but was released in September 1973. He returned to his home town to sign for Falkirk and later played with Brechin City before retiring from the game. Sadly, he passed away in 1996 at the young age of 49 after a long illness. Mitchell is United’s fourth top all time goal scorer and twentieth in the all-time appearances table. In January 2010 he was inducted into the Dundee United Hall of Fame. Ian was born on this date in Falkirk. United recorded only their second win of the league campaign against a Raith Rovers side who looked all at sea for most of the game.